4 bed 2 bath. Space for the whole family! Descend slightly into a large parking area, enough for three cars. Four stairs to the front door. Sorry folks, garage NOT for tenant use. Welcome to Tutto Bene! A spacious cabin located just minutes from down town Twain Harte. With a marvelous kitchen featuring vintage pristine appliances that gives the cabin a uniqueness all its own. A perfect place to create a home cooked meal to share around the large dining room table (seating for ten). The large living room leads out to the deck, giving everyone space to enjoy a comfortable summer afternoon. 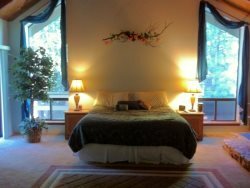 On the main floor of the house there is a sunroom with a queen futon, master bedroom with a Queen bed, full bath (tub and shower). Upstairs you will find two bedrooms and a loft boasting three fulls and two twins along with a full bath. Loft has a has a double Hide-a-bed and a single bed, 2nd bedroom has 1 Queen, third bedroom has two singles and a double bed. There is also a nice deck to enjoy a meal or,,,,a relaxed evening in the Hot Tub! This cabin is perfect for a large family! Dog allowed with an "damage protection fee" but you MUST request written approval from our management team. We must have 24 hour notice prior to your arrival. Dog allowed with an "damage protection fee" but you MUST request written approval from our management team. Hot Tub - Owner or Twain Harte Rentals will not be held responsible for Hot Tub activity. Use at your own responsible discretion.